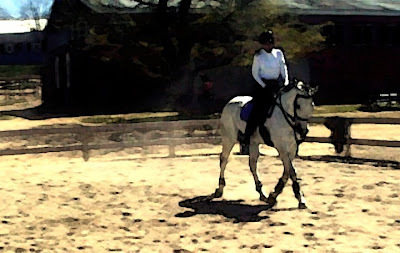 BKLYN Equestrian: "If you got it..."
Michele and Grayson had a flatwork breakthrough yesterday. Grayson has all the best Thoroughbred qualities in that he's very intelligent and will try his heart out, but historically he finds it easier to go faster than work from behind. This week something seemed to click, when "Gray" started to get the hang of moving over his topline and even showed some schwung (swing). Michele is preparing Gray for the Intro Level tests at the May 16 Stanhope Stables dressage show. At this rate, I think that the pair could land a respectable score if she decides to get their feet wet at Training 1 (no pressure though!). Though the elegantly built Michele began riding later in life, the rest of us are a little envious, since her body clearly was made for this sport. LIke most of us, I suspect that Michele would have liked to have gotten started a little earlier, but as her trainer Terri Stryker says in the video, "If you got it, flaunt it!"